Let's get a climbing centre in Fort William! For the past 4 years or so, I have been working on a book about climbing injuries. It spells out in detail how to treat them once you have them, based on the evidence from high quality scientific research and practice. More importantly, it discusses all the things we do in our climbing routine that cause our future injuries and prolong those we have already caused. I have titled the book ‘Make or Break’. This is because becoming an expert in understanding the causes and treatments of climbing injuries will be make or break for your climbing career. As Wolfgang Gullich said, “getting strong is easy, getting strong without getting injured is hard”. In my first book, 9 out of 10 climbers make the same mistakes, I suggested that many aspects of training for climbing are not rocket science. Keep showing up, pulling on small holds, pushing the limits of your motivation and learning from others and you will get stronger fingers and get better at climbing. It will be injuries that will get in the way of your progress, and if you let them, they will dictate how far you get in climbing. The research suggests that nearly all climbers get injured at some point. Finger injuries are most likely, followed by elbows and shoulders. Of course there are countless bits of our anatomy that can break if suitably mistreated. When you get one of these injuries, you need to be the expert, because unfortunately you cannot rely on anyone else to make sure you recover. This is not because doctors and therapists fail to do a good job (although they sometimes do). It is because there is no single source of advice on the vast array of things you must do to make sure you recover well and prevent future injuries. The climbing coaches, physiotherapists, otrhopaedic surgeons etc. that you will see will all give you pieces of the jigsaw puzzle, but it is you who must put them together. Claire MacLeod dispatching our pre-orders the other night. 1. Tendons don’t like rest, or change. I was shocked too when I read that. I was aware through my own experience that the advice I’d been given to recover from my own climbing injuries was often at odds with research I’d read. But to discover the extent of the lag between research findings and advice given to sportspeople is depressing. We only have one life and we cannot afford to receive outdated advice. Unfortunately, the internet hasn’t made the task of unearthing reliable advice any easier. Scientific journals remain hidden to most behind a paywall, while the same poor quality, outdated and non-specific advice drowns out the few reliable sources. One of the shifts in understanding from the past decade is that slow-onset tendon injuries such as golfer’s elbow do not respond well to complete rest. In fact, it often makes the condition worse. Moreover, many of the adjunct treatments often offered - stretching, massage, ibuprofen may do little to contribute to healing, and only affect pain. Instead, the most promising treatment has been large volumes of exercise of a specific mode (eccentric) and at a level which causes some pain. Much of this seems counterintuitive at first sight, which is why a detailed understanding of what happens in injured tendons is so important. Some practitioners in sports medicine are still working to a pre-1990s concept of tendon healing and will advise you to heal your injured tendons by resting them completely. In contrast, modern research has found that the best way to heal injured tendons is to use them, but only in a way that is specific to the nature of the injury. Tendons do not like rest or change. The successful formula is to provide constant stimulus to tendons to maintain their health. But if you want to change that stimulus, such as by training harder, you must do so very carefully, using all the cues from the body that you can listen to. Section 1 of the book discusses in detail the limitations of the sports medicine industry and how to get the most out of it, and section 4 details the modern understanding of tendon injuries and how to successfully treat them. Above I hinted at the difference between the pain level and the healing status of an injury - a crucial concept for any sportsperson to understand. Understanding of the nature of pain has been another area of science that has advanced hugely in sports medicine. It is not enough to be able to listen to your body. You need to be able to decode the messages and see the patterns in them. This is both a science and an art. Climbers need to be able to differentiate between healthy soreness from training and activity, and damage that demands action. They need to be able to take understand how various treatments affect pain from their injuries and what this means for their daily decisions on how much activity to expose them to. They need to understand how many aspects of their environment and psychological state amplify or suppress pain sensations from their daily activities. Pain sensations are an essential measure for climbers to monitor, but without detailed knowledge of how it works, it is very easy to interpret those messages from pain wrongly. Section 2 of the book is entirely devoted to understanding pain. A young body can withstand a surprising amount of abuse. But the relentlessness of sport and training amplifies the effect of small imbalances or errors, and it doesn’t take long before these accumulate to the point of injury. Balance is the key word here. One area of sports medicine that has come on a fair bit in recent years has been the recognition that athletes need to develop strength in a balanced way, taking care to strengthen muscles on both sides of joints. That is a good development, but it is not enough. Balancing of the stress imposed by training for climbing needs to come in several other ways too. Matching increases in training intensity with improvements in the quality of rest is one way. Improving technique and the design of the training progression to spread that stress is another. Sections 1, 3 and 4 deal with these concepts and the specific details that climbers should be aware of which commonly result in climbing injuries. 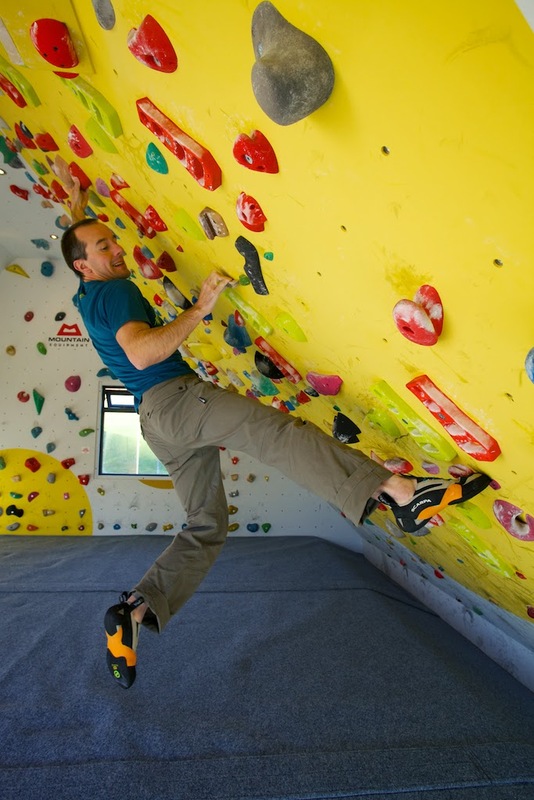 Repeated forceful internal rotation of the arm (the right arm on this move) is a big part of climbing. So it is no surprise that the internal rotators of the arm at the shoulder become dominant. You may well get years out of a healthy young shoulder without feeling a thing. But the resulting impingement syndrome affects so many climbers. If you'd rather prevent it, it's not hard to do a little work to keep the shoulder joint working well. And if you are already suffering, you may be able to reverse it quite quickly, unless you've really tried to ignore it for too long! 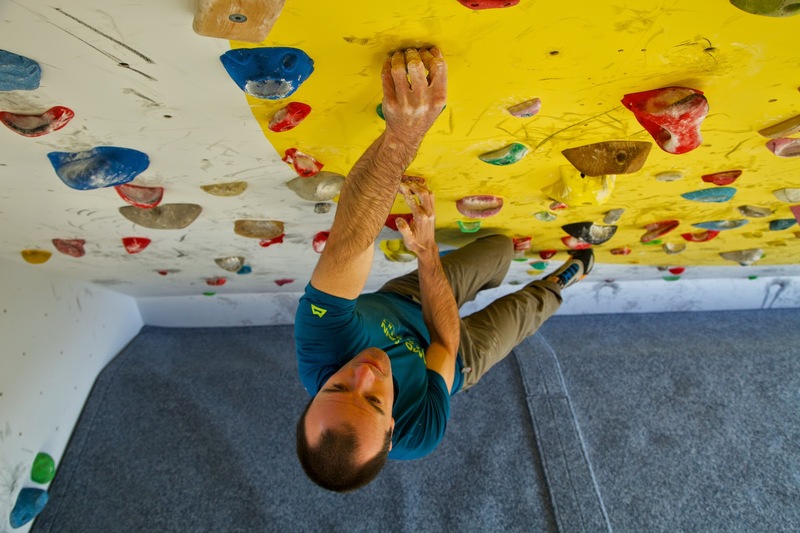 Maintaining awareness of the foot during hand movements is a core skill in climbing injury awareness. Slipping feet are a important cause of many finger and shoulder injuries. Do your feet slip too often? Do you know what to do when they do slip? Correct your climbing technique and you can push your body a lot harder before it starts to complain. Finally, there is the psychological challenge of injuries which is hugely underestimated by both climbers and their friends and families. In sections 1 and 5 of the book, I present the idea that we should see the injuries we suffer as a crucial message that something must change in our way of approaching climbing. By seeing the injury as an opportunity to go back to basics, to understand what must change and make that change, we can not only improve our climbing, but enjoy the process rather than endure it. I hope the book will help many climbers prevent their future injuries or overcome existing ones. You'll find the book in our shop here, dispatching worldwide. I haven't had a chance to read the book yet but this post rings several bells. I had an Achilles tendon injury - sore but not debilitating - from running that had been grumbling away for several months when I spent a weekend climbing with a physio with a particularly strong academic background. He talked me through his understanding of the literature on various potential treatments and the extent of the evidence in favour of sudden, moderately violent, eccentric exercises. This approach fixed the injury in a matter of weeks but clearly isn't/wasn't standard clinical practice on the grounds that the research evidence was still quite anecdotal and because the theoretical understanding of why this might be an effective treatment was also rather vague. As another example, I had a mild shoulder injury for years that never quite went away and occasionally gave me some discomfort. When I experienced a prolonged increase in discomfort I did some research and found descriptions of exercises that used a resistance band to load the individual rotator cuff muscles; again, a few weeks of this seems to have produced a permanent recovery. As a final example, I had a couple of A2 pully partial tears, many years ago, that just wouldn't completely resolve despite extended rest. The final solution was to start climbing properly again (carefully, but going back on proper hard - for me - routes). I'm pretty sure the first and last of these at least would have been unlikely recommendations from a typical health professional. However, having not had an A2 pulley injury for over ten years, more-or-less on the day this book was announced, I've had one pop. Not a full tear but quite bad I think. I'm just waiting to get hold of a copy of this book to see if Dave's recommendations match my experience or whether there are some even better approaches I can take, and I'm having a hard think about whether anything precipitated the injury (other than a horrible little sit-start) - too much Xmas pudding, some 60 hour weeks at work, and a NY resolution to get to the wall more, I reckon! Will you offer a kindle version? Tommy - We are not planning a kindle version for a good while. Luc - Most (good) sports medicine texts are two or three times the price of Make or Break, but are less specific. A reflection of the time and resources that go into their publication. I wanted to keep Make or Break cheaper than the cost of a single appointment with a physiotherapist. I certainly wish it had been out when I was a teenager - it would have saved me thousands in seeking the right advice the hard way. I hope it provides this sort of value for you, and good luck with your climbing. You are absolutely right. I think I just got surprised at the final Paypal checkout. I probably would have paid double that to get your book anyway. I'm over 40 now, and injuries are always a threat. So please disregard my first post, I think I reacted more on the fact that we have a shiity currency these days ! Book came in, looks stellar, tons of info here. thanks Dave! I live in the USA and I noticed your book available on amazon. Is there any difference ordering from there versus directly from you? I guess the point of my question is, Which site would you prefer a person to order from? Core made our matting. Definitely not a cheap option for a home wall, but really good quality. Cody, It's better for us if you order from my site rather than the mighty Amazon. Plus you get a signed copy! I don't think eccentrics are any more important than concentric or isometric forms of loading when it comes to tendinopathy rehab. Alfredson's studies of eccentrics were done in the 60s and the more recent research by the like of Peter Maliari demonstrate this. Rory, It's possible you are right. There are no firm conclusions in the research yet. There is much still to learn about what is working and why. as I read your "9 out of 10 climbers..." book in german, I want to know, if it is planned to translate this Book in german? Will be there a german version of the book?